Художник Чиро Маркетти, используя возможности компьютерной графики, попытался создать таро ХХI века, опираясь на древний символизм и структуру Таро Райдера-Уэйта. Прилагаемая книга дает пояснения по толкованию значений карт. 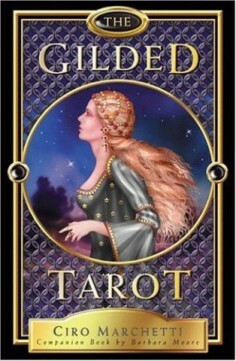 Welcome to the Gilded Tarot world of fantasy, magic and enchantment. Its release as a mass-produced and widely available deck has been awaited with anticipation by those of us not able to afford one of the luxurious limited edition, hand-made copies direct from the artist, Ciro Marchetti. There are few decks with artwork that I’ve found quite this attractive. Ciro’s art is a sophisticated blend of digital paintings drawn by hand on a graphics tablet, and some pasted elements (mostly faces). The vibrancy and choice of the colours is fantastic: the backgrounds of blue skies, sunrises, night skies, twilight, stars and comets in many cards are so luminous they almost appear to glow, as do the strong, saturated blues, greens, purples and reds of the medieval-style costumes. In symbolism, the Gilded Tarot is fundamentally Rider-Waite but it is not a clone or even a re-drawing of Pamela Colman-Smith’s very familiar art. Rather than simply copying, Ciro has used its imagery as a jumping off point for his imagination and inspiration. The Gilded Tarot isn’t one to use for its comparative historical symbolism or occult and esoteric depth, but the card images are unique and beautiful, feeling more like a beautiful fantasy or the inhabiting of a hyper-real dream-world than the Rider-Waite ever did. The minor suits are Cups, Wands, Swords and Pentacles. The chosen suit symbols are fairly standard, though the Wands are unusual. Rather than magical or living wands, the Gilded Tarot has a unique baton that appears more like a fountain pen with a metal ring attached to one end. The deck has a few other mechanistic touches, especially noticeable in the Wheel, the Sun, Star and Moon, which is slightly at odds with the non-technological fantasy landscapes. While the most of each card scene in the Gilded Tarot is a digital illustration, the human faces are not. Photographs rather than drawings of faces with the appropriate expression and angle have been used instead. I like this effect; my eye is drawn first to the human face in a card and I find it off-putting if a face is drawn clumsily or out of proportion (not an uncommon occurrence in many decks). The faces of the Gilded Tarot’s medieval characters have a distinct reality of expression, which has been matched to the mood of the card. Overall, my favourite cards of the deck are the Hierophant (not usually one of my favourites, but the combination of the stained glass and robe colouring is stunning); Judgement, which seems to glow; the natural meadow scene with the moon in the Ace of Pentacles; the lighting, sky and colours of the Two of Wands and Page of Wands; the blue and purple sky colours in the Knight of Swords.